Los Angeles theatres April 17th and then expanding across the country. "Brian Weathersby (Paul Dano) is a 28 year-old salesman at a high-end Swedish mattress company. The afterthought child to elderly parents (Ed Asner, Jane Alexander), and the youngest son in a trio of successful brothers, a shady oil man (Ian Roberts), a surgeon (Robert Stanton), Brian is searching for his place in the world. Unfulfilled by his work he spends a good portion of his day pursuing his goal of someday adopting a baby from China. He gets swept up in a romance with the lovely but misguided Harriet Lolly (Zooey Deschanel) when she comes in to his store one day and falls asleep on one of the beds. To win her over, he must compete with her bear of a father, Al Lolly, (John Goodman) an art-collecting loudmouth with a bad back and deep pockets. 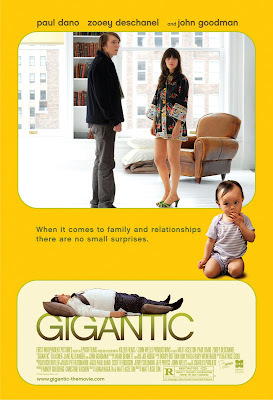 Gigantic is a funny, surreal love story about the anxiety that comes when two people with crazy families collide unexpectedly and fall for each other. "I’m very interested in films and stories in which reality and absurdity cross. Luis Bunuel , David Lynch , Jean Luc Godard , Hal Ashby , Robert Altman among others have mastered this in a way that I’ve always found inspiring. When we wrote this movie we knew two things: that there would be a nameless assassin hunting the main character and that we’d rather not overtly explain why. It seemed important to leave things interpretive and not overly expository. I shot the whole film with this idea in mind. In character driven movies like Being There or The Discreet Charm of the Bourgeoisie there are plain characters populating surreal worlds, and there is no need to explain their actions, or the madness that surrounds them. It’s just there and you believe it. Whether you care to dissect whatever larger point, or metaphor they might be suggesting is incidental, what’s important while you’re watching those movies is what’s happening on screen. This story has characters with complex family relationships that collide and it was crucial that we let the actors help to figure out their own approach to the awkward but inevitable task of allowing personalities to clash in a compelling, honest manner. This is the most exciting thing about film making to me and it’s also the way I find actors can make tricky scenes with very subtle emotional cues seem natural and off the cuff. The majority of the film was shot on medium-long lenses, which gives it an observational feel -- like eavesdropping on people’s lives. Because it’s mostly a comedy I thought it was important to catch it out of the corner of your eye as opposed to having it presented to you. Making a ‘mostly comedy’ is tricky, if you stray too far in pursuit of laughs you lose the emotional core of your film. Overall, I wanted the film to feel entirely in the present. There are rich back stories for all the characters that we didn’t really indulge and there is, in general, an arching omnipresence in film to force audiences into feeling assured about the life of the characters after the credits scroll, that I tried to avoid. I was mostly concerned with what was happening to these characters in the present moment they resided. As a director it’s fun to not have to worry about the characters in some whimsical fictional future, and to not care all that much about their past. It’s liberating for the characters, it allows for spontaneity and it’s ultimately the only thing that really matters. At it’s leanest; it’s a story about a single man trying to adopt a Chinese baby while a homeless assassin tries to kill him. At it’s richest it’s about people, what scares them, what excites them, and how they treat each other. I’m interested in talented people with little ambition, loudmouths and boot-strappers. I like human beings with contradictions and families with deeply flawed infrastructure. Cornerstones of great stories for centuries, they’re inherently funny, and interesting -- I’m thankful for all of them."